This helmet is great very functional. Just what I needed after upgrading from my half helmet from daytona. Keeps the wind off my ears and it is not too hot. I only wish the straps would be a snap on as opposed to the typical loop. But I still love it. Great buy. First thing you do is pull that goofy bill off and hide it. Now it looks cool. I have been looking for a 3/4 helmet that didn’t make me look like Mr. Mushroom head. Wasted much money on helmets that promised to have a smaller profile but did not. After some research I decided to roll the dice one last time and I am very glad that I did. First it looks great. Best fitting helmet I have ever had. I wear a large and at first I thought it was too tight as it was quite snug out of the box. It even left marks on my bald head, ouch. Then I remembered a review I had read that said if they were too tight to use you thumbs to press down on tight areas. I did that a couple times on each side in the temple area for a couple minutes. Much better now. I wore a do rag under it and that seems to have loosened it up even more. Now it fits snugly but is very comfortable. This helmet is well constructed especially considering the price of $62. Unbelievable bargain. Does not raise up when I cruise at 80 with a wind screen on the bike. My other open faced helmets all do. With a do rag on it is very quiet at 70 and 80 mph. A little more noise without the do rag so I would wear one on a longer ride probably. The matte black color looks good. Also it has a surprisingly nicely fitting chin strap. I may order another one before the price increases. Highly recommend. This helmet lives up to it’s expectations so far. This is one of the lowest profile helmets I’ve owned to date. It is replacing a Licks NOVDOT 3/4 helmet and when I put them side by side they look almost identical, see picture. I’ve only had this helmet for a few weeks but have put it through all of my typical riding situations. Even at highway speed I get no helmet lift and it stays snug in place. This is on a naked bike with no wind screen. The only feature I am not thrilled with it the ratcheting strap. I have never had a helmet with this feature so maybe I just need to get used to it. Also, there is no snap for the extra helmet strap so you need to tuck it somewhere so it doesn’t flap in the wind. Although both of these helmets are a size large, the measurement charts are slightly different and the Licks large is slightly bigger and more round. I would classify the Daytona as an intermediate oval which makes it fit my head a little better. I was in between sizes (M-L) with Licks so the large started fitting looser over time. The Daytona I was spot on at the low end of a size large and the fit is more snug and comfortable. 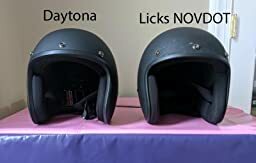 I originally planned to by another Licks at the smaller size since they’ve changed their helmet slightly since I purchased this one but they are always on backorder and the Daytona was almost half the price. I would almost wager that these helmets are made in the same factory. If you’re looking for a low profile 3/4 helmet I would highly recommend the Daytona.